In 2017 one Newsletter and a news sheet were published and circulated to members. These contained information about the activities of the Guild of Railway Ringers and can be found on the "Wheeltapper" tab above. In 2016 two Newsletters were published and circulated to members. These contained a great deal of information about the activities of the Guild of Railway Ringers and can be found on the "Wheeltapper" tab above. Four meetings were held in 2015 - 21st February in Bristol, 25th April in Wolverhampton, 4th July on the Isle of Wight and 19th September in Peterborough & Stamford. All meetings were thoroughly enjoyed by those taking part, having been meticulously planned by the volunteer organisers. Members of the Guild of Railway Ringers enjoy good ringing on their meeting days, sometimes supplemented by a visit to an attraction of railway interest. Formal business is kept to an absolute minimum on the AGM day in July as we'd rather be ringing or enjoying something of railway interest. New members are always welcome, however tenuous your interest in railways might be. You will find we are a friendly and welcoming group. A coach trip to towers in and around the Nottingham area was enjoyed by members. An excellent day out was enjoyed by members old and new (and some of the ringers were actually quite young) with friends and family joining in. Thankfully the weather was good but we did have to dodge some football crowds on the way to Holloway. Approximately 25 ringers enjoyed the bells at the two Islington towers (St James & St Mary) then made own arrangements for lunch. After ringing at Holloway St Mary, we were served some very welcome refreshments at Dalston St Mark by the local ringers. The final tower of the day at Hackney, St. John the Baptist were thoroughly enjoyed and rounded off a good day's ringing organised by the Chairman, Chris Bassett. An excellent day out was enjoyed by approximately 20 members, which included a trip and/or walk to the end of Southend Pier Railway on a bright blustery day. The ringing was good too. July 13th 2013 - AGM Kidderminster. The AGM held on 13th July was a success in many ways not least with a good attendance and perfect weather. The chosen venue of the Severn Valley Railway saw members converge at Kidderminster and alight at Arley enjoying the cooling effect of the river as they walked to ring on the 6 bells. Some managed a quick pint before returning to Bewdley on the only diesel- hauled train of the day. Lunch at a local Wetherspoons pub was followed by ringing on the 8 of the parish church, AGM and then steam again to Kidderminster. The short AGM meeting saw no less than 9 new ringers ratified for membership, very encouraging. Officers were re-elected and after some discussion the venues and dates for future meetings were agreed. The 12 bells at Kidderminster were put to good use before we dispersed home in (mainly) welcome air-conditioned trains. Ringing was of a good standard ranging from Doubles through London Major and up to Stedman Cinques and Little Bob Maximus. The spring meeting of the Guild of Railway Ringers was held on 27th April and was based on a coach tour of the long closed Basingstoke to Alton railway line. A coach collected the 28 members, which is nearly half our total membership, and friends from Basingstoke station and set off to the first tower Herriard 6, 7cwt. The bells at Herriard were augmented from 3 to 6 and restored in 2008/9 and access was via a series of ladders. The coach then set off down the A339 which runs very close to the original route of the closed railway to the second tower All Saints Alton 6 bells 6cwt. These bells have also been recently restored. The Basingstoke to Alton line was opened in 1901 and was the first light railway to be constructed in the country. It had a chequered history, passenger services ceasing in 1924 and final closure in 1937. The line was used for the filming of “The Wrecker” and in the comedy “Oh Mr Porter” which featured Cliddesden Station as Buggleskelly. Lunch was taken in the White Hart at Holybourne which had been pre arranged by our organiser Martin Boult. From the lunch venue it was a short walk up to Holybourne church to ring on the 8 bells tenor 6 cwt. This was a brand new set of 8 bells installed in 2008 where some fine ringing took place. The original 3 bells are still retained in the tower as clock bells. Chawton 6 bells, 6cwt was the next tower, which again has had recent restoration work carried out in 2009. The final tower of the coach tour was Bentworth 6 bells 6 cwt before heading back to Basingstoke station so those that had travelled many miles to come to the meeting a chance of catching trains to get them home in reasonable time. However the coach stopped at All Saints to allow those members who had never rung on the only 9 bells in the world to ring there and after this small party moved off to St Michaels. Our thanks go to Martin Boult for organising an excellent day. On Easter Monday, 1st April 2013 a quarter peal of 1260 Grandsire Triples was achieved by Guild members at St.Swithun, East Grinstead. The quarter peal was rung to celebrate the opening of the Bluebell Railway to East Grinstead. Twenty-two members and four visitors enjoyed some excellent ringing on four towers in and around Warwick and Leamington Spa. Ringers also enjoyed lunch in various local pubs or restaurants in Warwick. Walking between the Warwick towers then train to Leamington Spa after lunch. The next tower at Lillington was reached by bus, whilst one member decided to go shopping instead! At the final tower of the day in Leamington Spa, thanks were expressed to the organiser, Chris Mew for an excellent day out on what was a cold but bright day. The 2012 Annual General Meeting was held on July 7th in Brighton with 16 members attending. Considering that it was July the weather on the day was very dismal with periods of showers. Ringers made their way by train and bus to Aldrington where the 6 bells were rung to a mixture of doubles and minor methods. It was then time to return to Brighton and ring on the 10 bells at St Nicholas. The bells were put to good use with Stedman Triples and Grandsire Caters and Yorkshire Major being rung. The weather brightened for a short period when most of the members walked down into the city to sample the newly opened Weatherspoons. 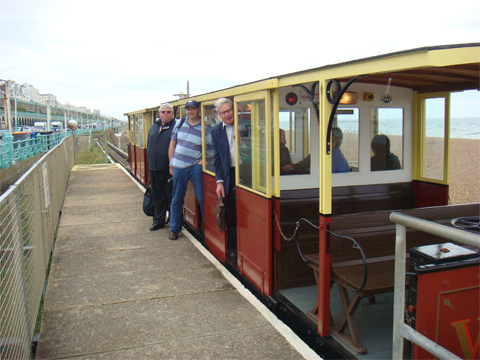 With the weather turning worse some keen members sampled the Volks Electric Railway with a return trip from the Aquarium to the Black Rock station at Brighton Marina. The Volks railway is the oldest operating electric railway in the world and is of 2 foot 8 ½ inch gauge. The Annual Meeting was held in the belfry of St Peters Church. All officers were re elected to their existing posts: Chairman; Chris Bassett, Secretary; Chris Mew, Treasurer; Sue Bassett, Independent Examiner for the accounts; Dave Wilkinson. The main discussion focussed on where members would like to visit for the 2013 meetings and updating members on arrangements for future meetings. Ringing then continued at St Peter's with Stedman and Grandsire Caters, Cambridge Major and Call Changes. Thanks were recorded to the incumbents and tower captains of the towers visited and to Gavin Bennett for making local arrangements. The Railway Guild is open to all who work in, retired from or are connected with the railway industry, together with members and supporters of Heritage Railways, Transport Museums, miniature railways etc. Basically if you have any connection with a railway you can become a member. We have a Railway Guild Newsletter "The Wheeltapper" produced by Tony Manktelow which is issued free to all members. 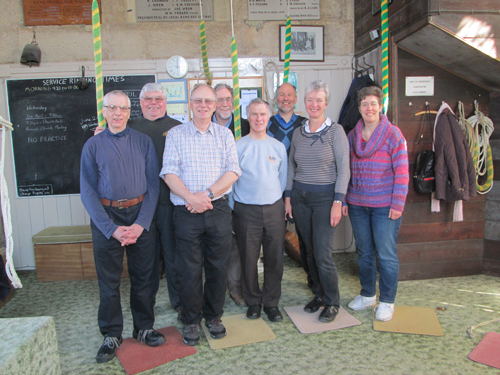 All ringers and friends are most welcome to join us at any of our events.